Story: Hokey is a wolf who lives by his wits; mostly cheating and conniving to get food without too much work. To help him, he has his sidekick Ding-a-Ling. 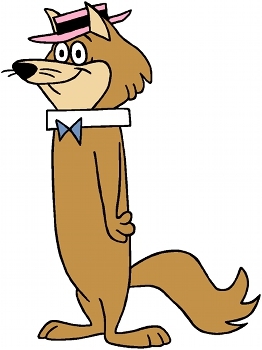 Background notes: When Yogi Bear was moved from The Huckleberry Hound Show to his own series in 1960, a new series was needed to fill the slot. For this the series Hokey Wolf was created. The series was about the slacker and con artist Hokey Wolf (voice by Daws Butler) and his sidekick Ding-a-Ling (voice by Doug Young), trying to cheat their way to food and occasionally other things. Like Flintstones originally being a new version of The Honeymooners, Hokey Wolf was a new version of Sgt. Bilko, down to Hokey sounding like Bilko. The series lasted 29 episodes from 1960 to 1961. Reruns of the series was shown again in Yogi Bear and Friends in 1967, and it wasn't until Yogi's Ark Lark in 1972, Hokey and Ding-a-Ling were seen in a new cartoon. As recurring characters Hokey did no appear again until Scooby's All-Star Laff-A-Lympics in 1977, and Ding-a-Ling not until Yo Yogi! in 1991. After Scooby's All-Star Laff-A-Lympics Hokey only appeared in two episodes of Yogi's Treasure Hunt (in 1985 and 1986) and two episodes of Yo Yogi! from 1991. The two episodes were also the last and only appearances of Ding-a-Ling. In Yo Yogi! Hokey was the mayor of Jellystone Town and Ding-a-Ling his photographer. In comics Hokey and Ding-a-Ling first appeared in Huckleberry Hound #12 from 1961. Like other Hanna-Barbera characters, they were featured in the various series based on the Hanna-Barbera cartoons. The two characters only appeared in a few stories (approximately 20) until the last record from 1978. In terms of sequential art, though not a comic, was also a Little Golden Book from 1961. Hokey and Ding-a-Ling also appeared in a few pieces of merchandise like figurines, a coloring book, a watch and most likely as a part of some board games from the 1960s.